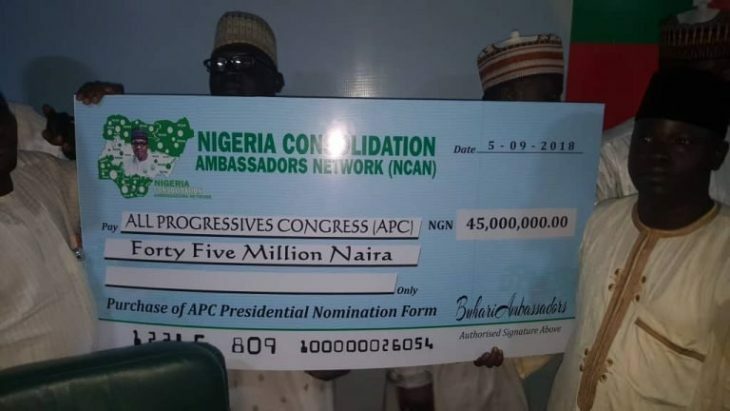 THE Nigerian Consolidation Ambassadors Network says the decision to foot the bill of President Muhammadu Buhari’s expression of interest and nomination form to contest in the forthcoming primary election of the All Progressives Congress – APC, was motivated by the administration’s determination to ensure a greater and prosperous Nigeria. The Nigerian Consolidation Ambassadors Network, one of the many pro- Buhari groups who had lobbied to purchase the form for the president, also said it embarked on the project because it believed it was important for the President to consolidate on his achievements so far. “We have no doubt that Mr. President has both in action and word being working hard to lay a foundation for greater and prosperous nation that our generation and future generations will be proud of. Under his administration Nigeria has become a country sought after for investments in the world; Nigeria has assumed its leadership role in not just Africa but the world,’’ National Coordinator of the group, Barrister Sunusi Musa, said. Buhari is the first aspirant to obtain the nomination form. The expression of interest and nomination form was sold for N45million.